Hello and Welcome to HiTricks. We are writing here after a long time. 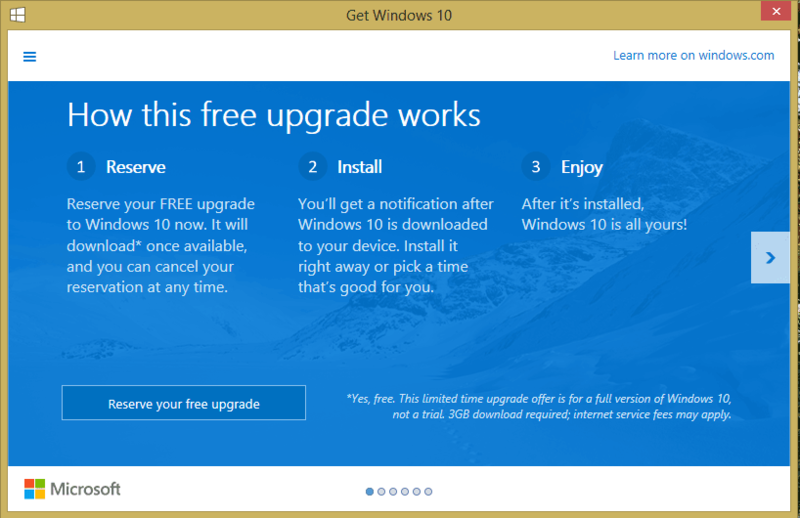 Good news for you all running on Windows 7, Windows 8 and Windows 8.1, you may get a free upgrade to Windows 10. Isn’t that a great news? 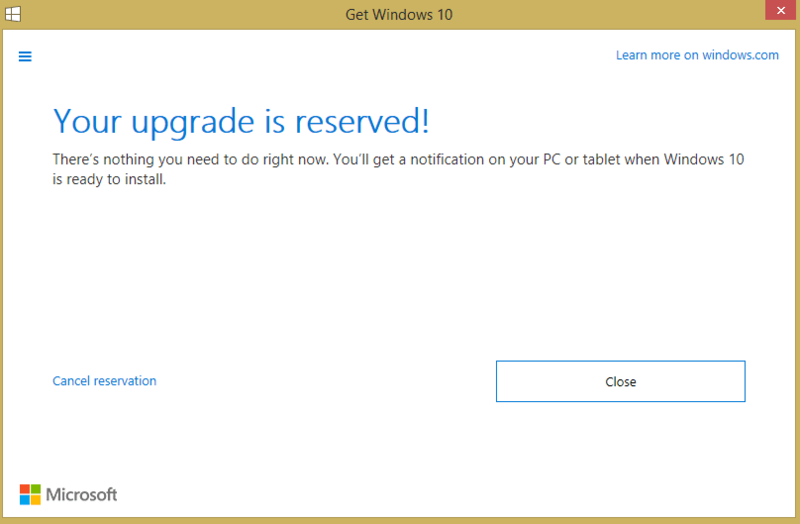 All you need to do is to reserve the windows 10 upgrade for your device. Note that windows 10 has not been released yet (only its technical preview released) and by reserving the windows 10 update for your device, you can get an automatic update to Windows 10 whenever it is available. Hurry! Reserve your upgrade now. LATEST NEWS: Windows 10 Upgrade Released. You have already waited for this day, now don’t wait more. Now manually download and upgrade your Windows 7 and Windows 8.1 PC to Windows 10. 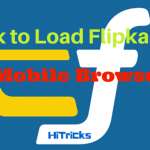 You can download and try it out right now. No need to wait for the default windows update notification, which may come after few days to few weeks. Try it here. If you reserve your device for getting the Windows 10 update, you will be notified when the update is available and then you can download windows 10 for your device completely free of cost. Yes, this is not a trial version of update, you will get the completely full featured windows 10 upgrade for your device forever. This is a great opportunity to grab the feature hot! Please note that the update is device dependent. Not all computer devices running on Windows 7, Windows 8 and Windows 8.1 will get this update. Your device will be tested by Microsoft and if its compatible, only then you will be eligible to receive the free upgrade to windows 10. Your start menu is back with a lot more customizations. Faster start up or shut down of OS. Easier and Smoothier Multitasking. Upto 4 screen divisions to run stuffs simultaneously. A personal assistant, Cortana to assist you everytime. Internet Explorer is upgraded to a whole new level, making it smarter from the old crappy browser. New and Upgraded Windows Store with a wide range of apps made just for you! Not only apps and games, you get movies, tv shows, music tracks too. You will need 3 GB Internet Data to download the upgrade. Consider doing it from a wifi zone if you don’t have much internet data. Your ISP fees may apply. 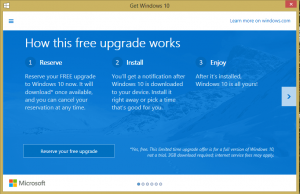 How to reserve your device foe windows 10 free upgrade? Well, to reserve your device for the windows 10 free upgrade, start your windows and come to main screen. Look at the taskbar icons to the right. You shall see a windows button. Refer to the image. 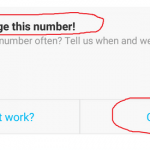 This button will only come if your device is supported for the free upgrade. Check for the button from now onwards. This button may take time to display as microsoft is gradually rolling out the upgrade from device to device, so you may see the button after some hours to some days. But keep checking for the button to appear. Note: You must have an active internet connection and have automatic updates checked and downloaded to receive this. Else you won’t get notified. Well, let’s proceed to the next step. Click the button. Congrats! Your device is reserved for getting free windows 10 upgrade. You will be asked to enter your email. Its your choice whether you will enter or not, but if you enter, you can get notified instantly when the update is available. Then you can upgrade your device to windows 10 for free. So, remember to keep checking for the free upgrade. Hope you may get the upgrade. Thanks for reading. Do share if you like it. Keep Visiting HiTricks.